Sorry I've been largely absent this week. If you don't follow me on Twitter, you probably don't know that I just tested positive for the flu. THE FLU! For which I got a preventive shot. This is what's known as Winning At Life. Anyway. There's been a lot of progress at the house this week, but I certainly haven't been able to document much of it. I did go over there one night early in the week -- before Death Himself joined my party -- and take a few cell-phone pictures, but they're going to have to wait until next week. Too much work for my feeble body at the moment. However. What I have to share with you today is arguably BETTER than progress pictures. Because it's a peek at my vision for the new kitchen. 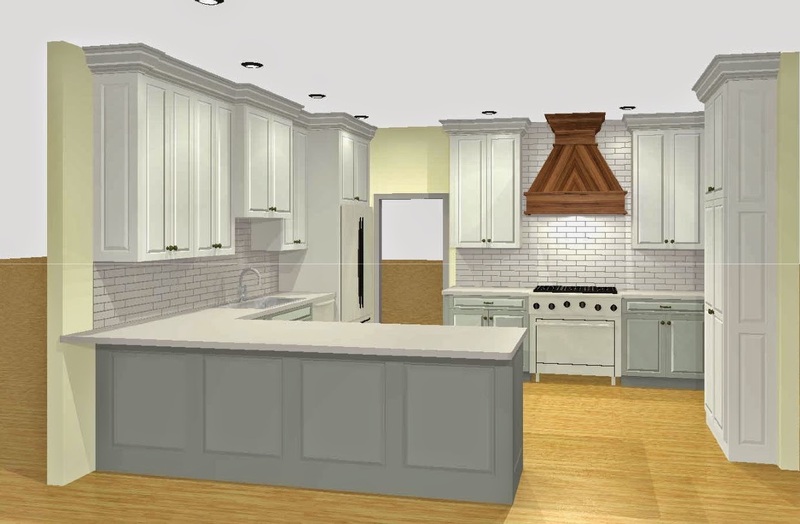 I say "approximation," because the lower cabinets will be a slightly darker shade of grey, the walls will be a (probably) grey-blue and the backsplash will be completely different than the subway tile you see there. I've chosen almost a basketweave backsplash in Carrera marble, but they didn't have anything similar to drop into the drawing, so we went with a plain subway tile. My floors are going to be stained much darker than these, too. I chose Mississippi Riverbottom Pine as the material for my range hood, which I'm supposed to go pick out next week. A white hood is standard with the cabinets, but I have my heart set on natural wood. I think the combination of the two-toned cabinets, natural wood and backsplash going up to the ceiling on that wall will be a beautiful focal wall in the kitchen. They aren't dropped in on this version of the drawing, but three simple corbels will be installed on this side of the peninsula, under the countertop, to finish off the look ... one at the far left, one in the center and one on the far right. They'll be painted the same color as the base cabinets. Trying to think if there's anything else ... I don't know. Any questions?